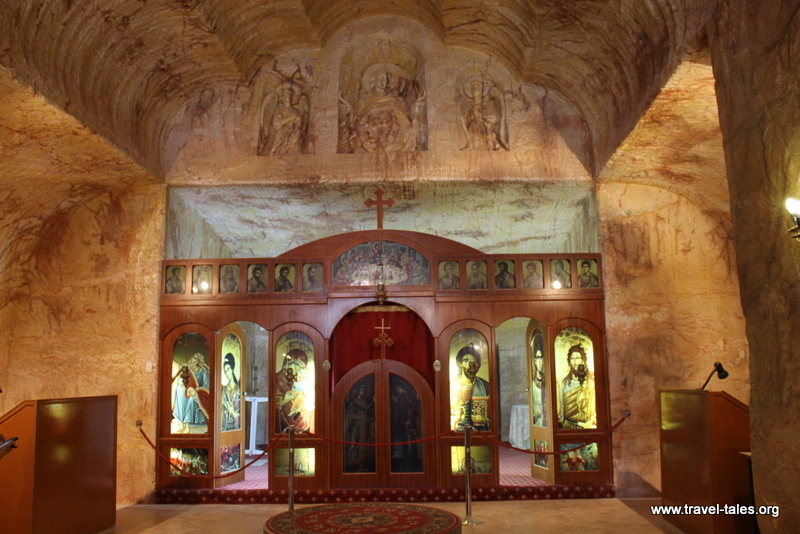 This is not a dash back to Europe again, rather these are pictures I took at the stunning church built by Coober Pedy mining drills for the Serbian and other Orthodox Christian residents there. The idea was born in 1992 after a priest from Adelaide visited Coober Pedy and he set about raising money so the Orthodox residents could worship in their home town. By August 1993 the main body of church had been drilled, giving it this fantastic roof. After that a variety of decorations and other embellishments were created so that by 1995 the church could be consecrated. As is the case with the underground houses, the inside of this church is pleasantly cool even at the height of noon temperatures outdoors. Previous Opals – lucky stones?